How about an efficient way of heating your hot water..? 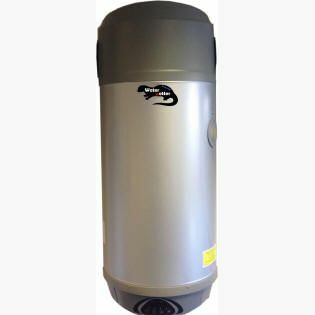 The 100 Ltr unit is fit-and-forget providing low cost direct hot water 24/7 and is particularly suitable for smaller dwellings and portable accommodation such as classrooms and meeting rooms. It is the lowest cost way to produce domestic hot water (DHW) all year round without fail and is half the price of buying and installing a solar DHW system. Air containing heat (that would otherwise be totally wasted or ineffective) is drawn in to the top of the unit (via ductwork, if necessary) and the heat is extracted from the air by the 680W Air Source Heat Pump and transferred in to the water contained in the integrated Direct Hot Water (DHW) cylinder and thus heating your water up to 60°C. The heat extraction process will also dehumidify the air if it has been drawn from a wet room (thereby also preventing mould growth from the damp air source). The ductwork (where required) can be rigid or flexible, whichever is easiest. Air can be ducted from bathrooms (where heat would normally be totally wasted through extractor fans), kitchens, laundry rooms, warm loft space, etc. Cool, dehumidified air is expelled from the unit and this air can be used to cool areas (such as kitchens, bedrooms, cellars, larders, etc. 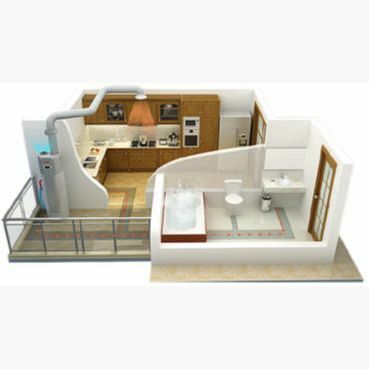 Our unique system can be used to direct cool expelled air outside in Winter and to hot rooms within the house in summer). Safe and healthy: The Water Hotter will automatically carry out a weekly pasteurisation cycle to ensure the safety and quality of the hot water. Our products and solutions are no different from any other appliance buy you make. Apart from that they tick all our boxes. Feel free to download our installation guide or browse other downloads. Works in Harmony with Infrared Heating. Super Efficient: All Water Hotter units use 'best in class' components to ensure that our designs reach the maximum possible efficiency. Greater availability of hot water at all times: With the Water Hotter Active Flow technology, the mixing is controlled with hot water availability is increased by up to 30%. Constant, Automatic water replacement: When you draw off hot water, it is replaced by cold water. With traditional systems, this enters your hot water tank in an uncontrolled way and the hot and cold water mix instantly.